This morning something propelled me to look at again at my blog/ website and I was slightly horrified that the last time I wrote a blog post was all the way back in March. Working 30ish hours a week and running my own business at the same time had somewhat caught up on me and I had run out of time to put together blog posts. However, I have now left my job, cut back on my selling and started my PhD. Now I am back studying I feel that taking the time to write he odd blog post here and there, mostly about fun things I have seen whilst completing my research, will be a good way to keep my ‘hand in’ with a little bit of writing- and also I hope it might prompt some people who worked for the firms I am interested in to get in contact with me. So… to make a start this advert is one of my favourite things I have discovered thus far. 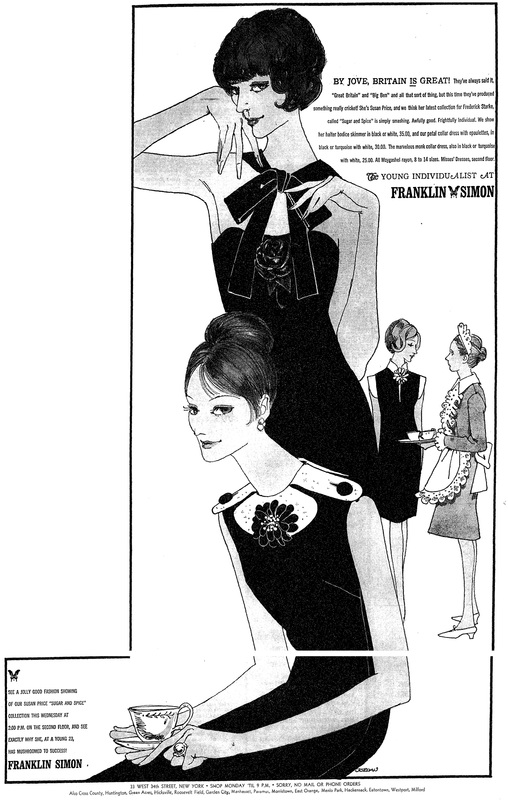 This New York Times article shows the American promotion of British fashions- and alludes to one of the Frederick Starke ranges I am researching as part of my PhD “Sugar and Spice”. So far I have drawn a blank as to who the young Susan Price is… but hoping to find more info as my research moves along. By JOVE, BRITAIN IS GREAT! They’ve always said it, “Great Britain” and “Big Ben”and all that sort of thing, but this time they’ve produced something really cricket! She’s Susan Price, and we think her collection for Frederick Starke, called “Sugar and Spice” is simply smashing. Awfully good. Frightfully individual. We show her halter bodice skimmer in black or white, 35.00, and our petal collar dress with epaulettes, in black or turquoise with white, 30.00. The marvellous monk collar dress, also in black or turquoise with white, 25.00. All moygashel rayon, 8 to 14 sizes. Misses’ Dresses, second floor. The Young individualist at Franklin Simon. See a jolly good fashion showing of our Susan Price “Sugar and Spice” collection this Wednesday at 2.00pm on the second floor and see why she, at a young 23, has mushroomed to success.